The yarn crawl last Saturday was such a blast! If you have never done this in your city, you should organize something similar. 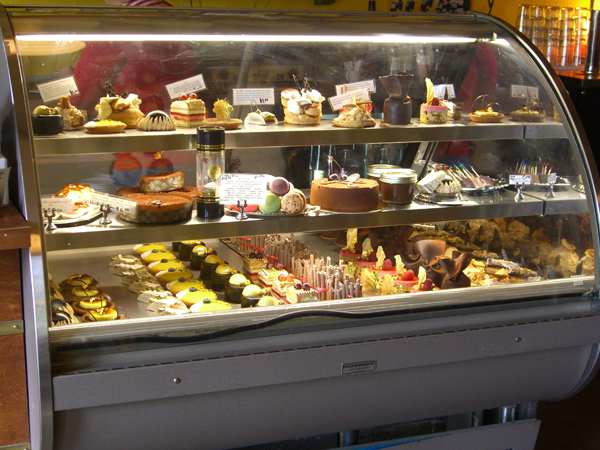 We went to five LYS, a cafe (OK, that was in one of the LYS) and a patisserie — all in 7 hours. Whew. Sara did an awesome job of both organizing and herding us around from place to place to make sure we got everywhere we were supposed to be going. Maia was here from out of town, and it was so cool to get to meet her! 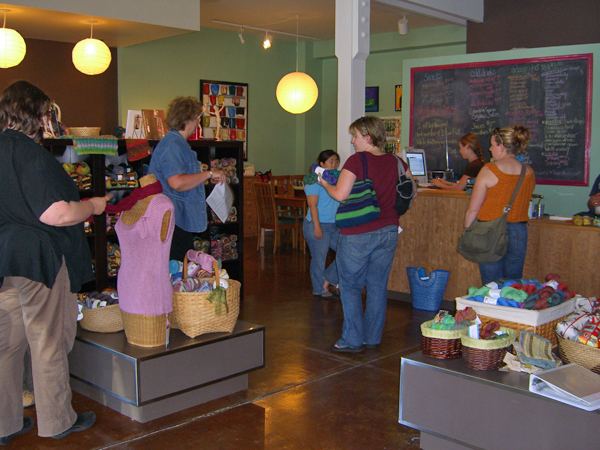 We all gathered at Abundant Yarn & Dyeworks. Because almost everyone was a blogger, there was a lot of picture taking going on. Here Cindy and Rodger are engaged in a shoot-out. There was a bit of yarn shopping that happened at AY&D. And, since they also have a cafe, some lunch happened as well. Our next stop was PIX Patisserie for a little dessert. Because it was, like my birthday, and while I don’t really celebrate that any more, still some dessert is called for, dontcha know. I know that this is a rather glum looking crowd, for some reason. Except for Chrispy. Chrispy and Cindy braved my taxi-driving skills and drove around with me. Have I mentioned that I’m sometimes easily distracted? I don’t think we had to go around the block more than twice because I got interested in the conversation and forgot to turn. But I’m really a safe driver. Mostly. Really. So I don’t think it’s my driving that has caused the glumness. I think it’s because we’re waiting for our dessert to be served. It was well worth the wait. Here are a few of the dessert choices. I couldn’t decide between two different goodies, so Maia and I split them. From there we headed up to Yarn Garden. They were a bit low on sock yarn, so I didn’t aquire any new things there. But I did have a great time petting the cashmere and silk. I don’t seem to have taken any pictures there, either. I think I was overcome by yarn fumes. The next stop was Twisted. They have a whole wall of sock yarn there, and much of it is from indie dyers. I managed to do a bit of stash enhancing at Twisted. Or non-stash-enhancing, since sock yarn doesn’t count. All of us petted the yarn and admired the lace scarf (a pattern for their lace class) and fondled the yarn some more, and then waited patiently to make our purchases, while fondling the yarn. From Twisted we drove across the river to Knit Purl. Usually finding parking is a challenge there — although well worth the challenge! But I found a place right in front of the door. I like to think of it as a little b-day prezzy from the gods of parking. I don’t expect it to ever happen again. The nice ladies at Knit Purl were waiting for us with cookies and iced tea. They have a wall of Koigu at Knit Purl. Just in case you didn’t catch that, it’s a wall of Koigu. 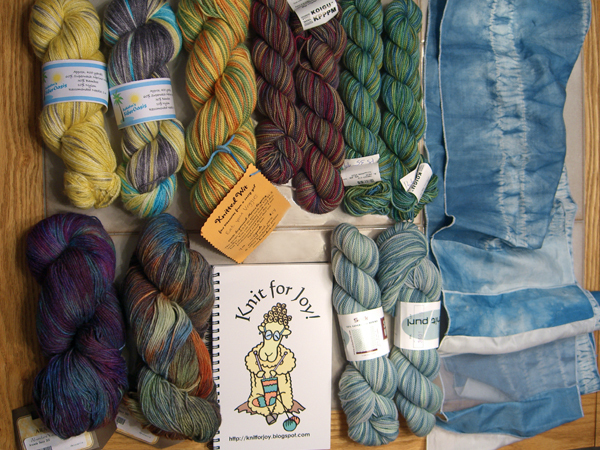 I madly snapped pictures at Knit Purl, but none of them turned out. I really, really want a new camera. But because I have other discretionary expenses that I’ve already committed to, I have resolved to learn to take better pictures with the camera I have. Sometimes that works better than other times. Ah well. Our last stop was Farmhouse Knit Shop. Despite driving by there on a fairly regular basis, I had never actually stopped in. It’s a really cute little shop. Sara is fondling the Blue Moon. That entire display case is all Blue Moon of all different kinds. Just in case you didn’t catch that, the entire display case is Blue Moon. 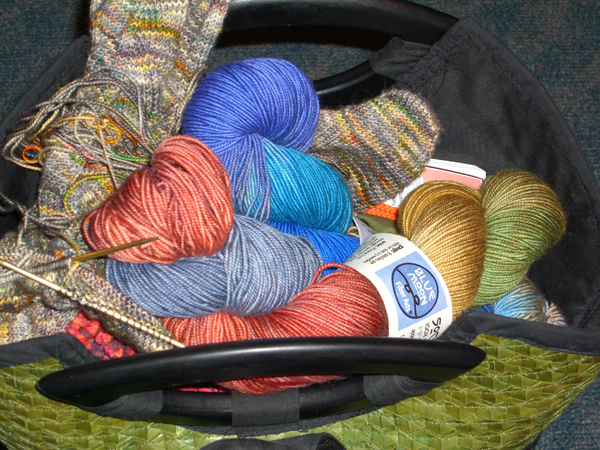 And that’s not all of the Blue Moon, because the sock yarn is back in another room. I showed what I consider to be a great deal of restraint. I did not get anything at Farmhouse. But they should expect I will be back. The day ended with dinner at a Thai place with Maia and Roger. And fine company they were! Chrispy and Cindy, bless them, both brought me a little b-day rememberance. Although I really felt I should be giving them something instead, for having put up with my driving the entire day. I had a very, very wonderful day! Right side: gift from Chrispy: Silk scarf, indigo dyed by herself! She also gave me a little hand-made soap that is not in the picture. With the Bo Diddley Socks off my needles, it’s time for a new beginning. Thanks to all of you who asked for the pattern. I’ll see what I can do. Being the wonderfully organized designer that I am, ahem, I have absolutely no notes. I did chart the stitch pattern the way I knit it, so at least I have that. But the rest… I’ll have to reverse-engineer it. So don’t hold your breath, ‘K? Here you see the very beginnings of a pair of Cable And Corrugations socks — that’s the light colored, cabled socks on the right side of the cover of Cat’s new book. Cat calls this the pontoon toe. It starts with the Magic Cast-On, but then you knit back and forth for a few rows on just one needle, so you end up with a little square. Then you pick up stitches on each side of the square. The increases are worked at the edges of the picked-up stitches, so the original square becomes a band that wraps sideways around the toe, and the picked up stitches fan out to become the top and bottom of the foot. It’s rather cool, and I like it a lot. But… it’s not the easiest toe to work in my preferred mode of two-at-a-time on two circs. So the picture shows how I’ve used a set of DPNs to pick up the stitches along the sides of the little square. 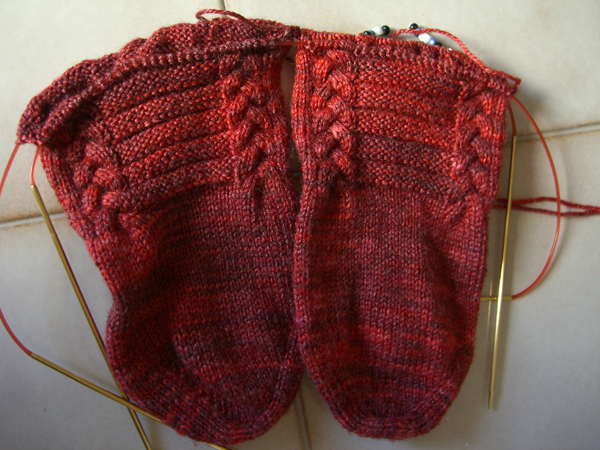 Since the toes end up sort of sideways on the needles, I also used the DPNs to help me shift the toes so that all of the instep stitches were on one needle and all of the sole stitches were on the other needles. I really like the way this toe works, but it’s definitely not one to work away from home when I just want to cast on and go, go, go. But it does make a pretty, pretty toe! And here is the results. These socks are really a fast knit. They would have been even faster if I’d actually trusted the pattern and knit it as it was written. But nooooooo. I knew better. I was sure that the socks would not be wide enough, even though my feet are skinny and the measurements looked right. Because I was sure that the cables would pull the fabric in too tightly to fit. If I’d bothered to actually read the pattern, I would have seen that Cat thought of that, because Cat thinks of everything. So, after knitting 4″ of toe, I ripped back to the correct place in the toe increases so I had the actual designed number of stitches, and reknit the toe. Yes, gentle reader, I’m a slow learner. But I can be taught. The yarn is from Pagewood Farm, a small wholesale dyer and spinner. The yarn is a yummy mix of wool, bamboo and nylon, and the colorway is called Really Red. It’s a nice, smooshy yarn to knit with, and the bamboo gives it a pretty sheen. As soon as I saw it, I knew I wanted to knit it into this pattern. And this is the sole side. 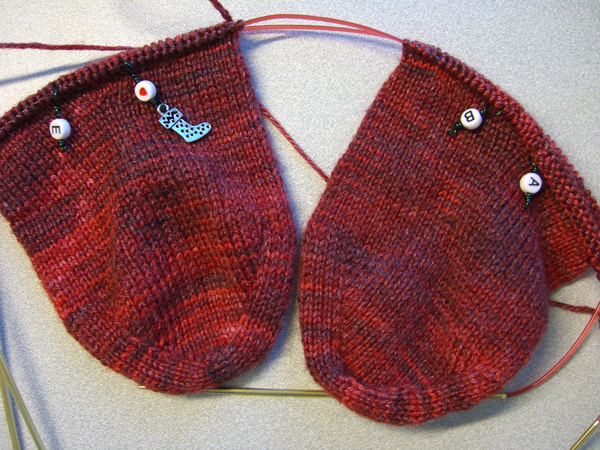 The gusset (if you want to call it that) is increased between the markers. I got the cute little lettered markers at Cat’s Magical Moebius Festival in Newport last spring. 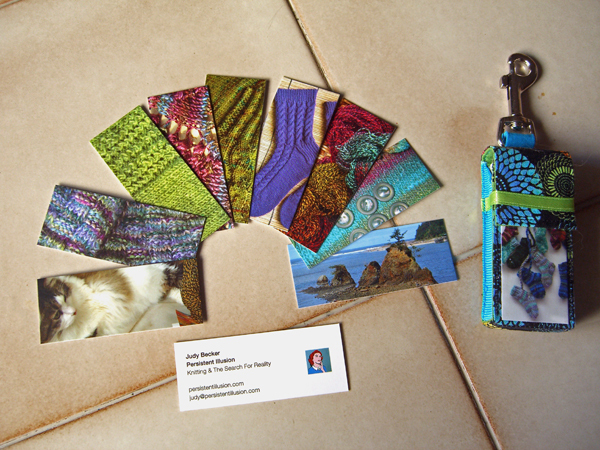 I believe that a major fiber arts company will be offering some really cool ones for sale soon. I hope. Because I’d really like to get another set. 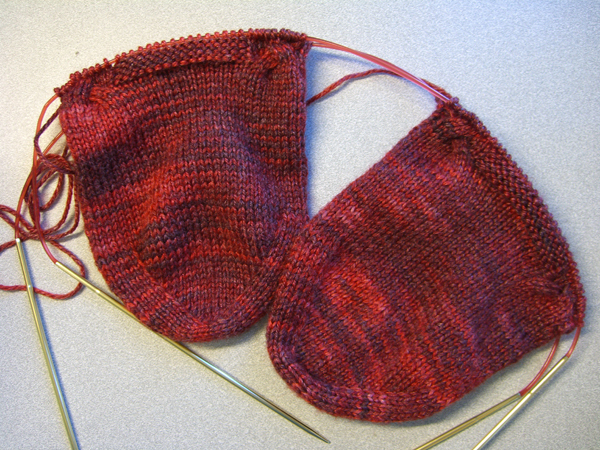 You can see that the first sock increases are between A and B, as instructed by the pattern. But the second sock increases are between… cute-little-sock-marker-with-heart and E. Yeah. It will be nice to have two sets. Tomorrow a group of local and not-so-local knitters are meeting for a Sock Yarn Crawl — sort of like a pub crawl, except with yarn. 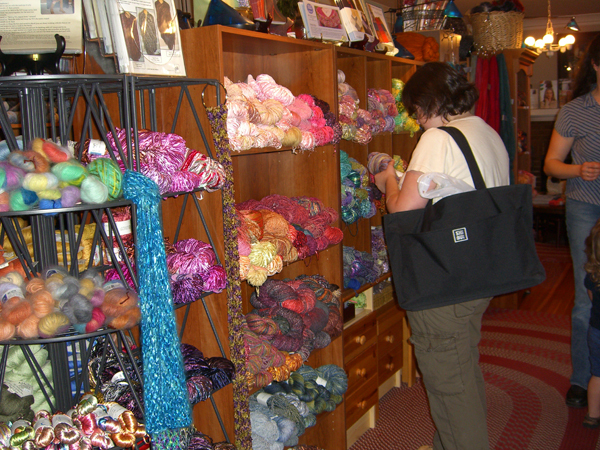 The crawl starts at Abundant Yarn And Dyeworks, and Rodger has the itinerary listed on his blog. If you are going to be anywhere in the area. Come and join us! Saturday is also my birthday, and there might be some pastry, or even adult beverages (I hope) involved. But not too much of the last, because driving will also be involved. Today I got a nice surprise in my mailbox. Or, actually, two surprises. But one I’m holding out on. You will see it later. The other you might not want to look at, unless you want a spoiler. 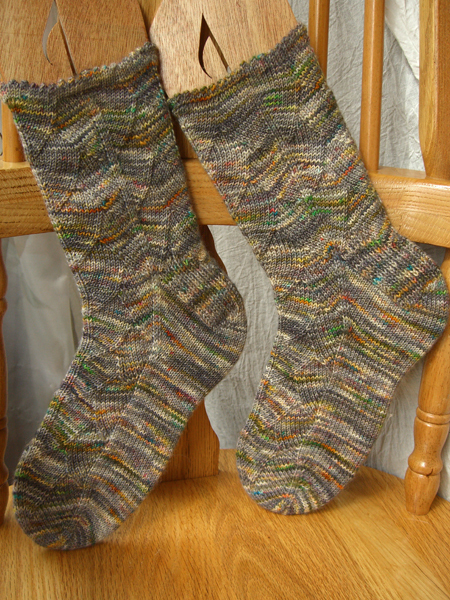 It’s the Rockin Sock Club August offering, down there below the little clicky link. Me likey! Flower Power! Yeah! Folks, I am old enough to remember this when it was new. It brings back my youth, it does. I love the colors. I love that it’s pretty psychedelia without being dayglo. And I like the pattern, too. I don’t have enough anklets and my one pair of lace anklets recently reached the point of no return regarding icky things like… holes. 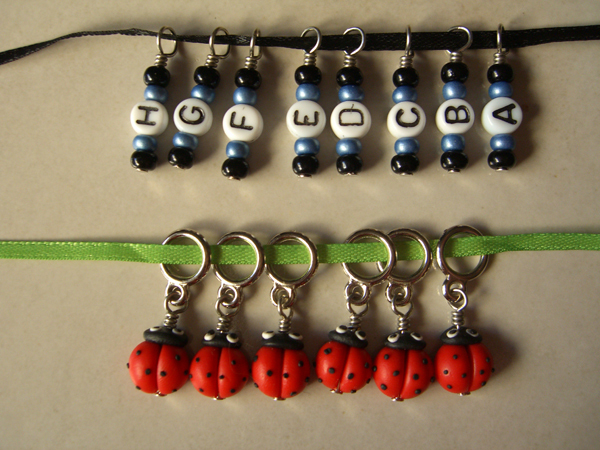 So I am looking forward to knitting these. But it probably won’t be very soon because I have a whole lot of other socks running around in my head just waiting to be knit. Some of them have been there for a long time, and really deserve to see the light of day. But anklets will be nice for next spring. I’m lovin’ my new socks. And because Who Do You Love kept going through my head every time I knit on them, I am hereby dubbing these the Bo Diddley Socks. I really wanted to get a pic of them slithering through the grass or posed along a tree limb, but yesterday when I took these pictures it was raining cats and dogs. So instead they are tip-toe on a chair next to the window – the only light that was available. The color is pretty true on my monitor. Notice how the first scale starts on the toe near the end and follows the line of the toe increases. Sort of. That was the plan, anyway. Go ahead and click on the picture to biggy-size it. I’ll wait. This picture shows the Dragon Scale pattern up the leg. Pretty, isn’t it? I love the way the pattern plays with the little short blings of color in this yarn. I think the pattern sort of resembles the up-and-down action that occurs in other chevron-style stitch patterns, like what is found on the Jaywalker socks. But this pattern is much stretchier than Jaywalkers are. I used a picot bind-off because I thought the little points would look cool and snake-ish with the scales. I didn’t bind off in the traditional sense. 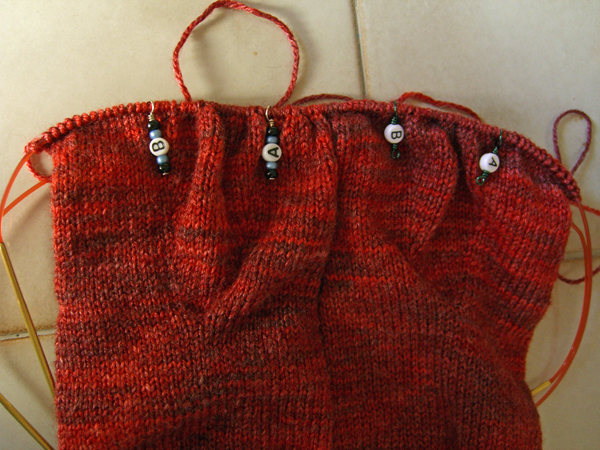 I just tacked the live stitches down inside using a sort of duplicate stitch, so the cuffs are really stretchy. Note that the cuff is vaguely wavy on top, still following the scale pattern. 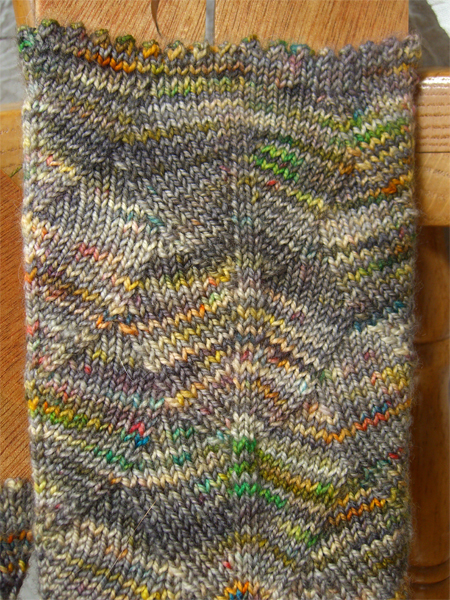 The other choice for a cuff would have been to replace the last row of scales with ribbing. The bottom of the ribbing would have followed the line of the scales, allowing the previous row of scales to complete. I think that would have looked cool also. Maybe next time (if there is a next time). I’ll see how well these stay up with no ribbing. That was what I did here on the heel: The heel stitch ends when the scale starts, so it follows the line of the scales up into the leg. 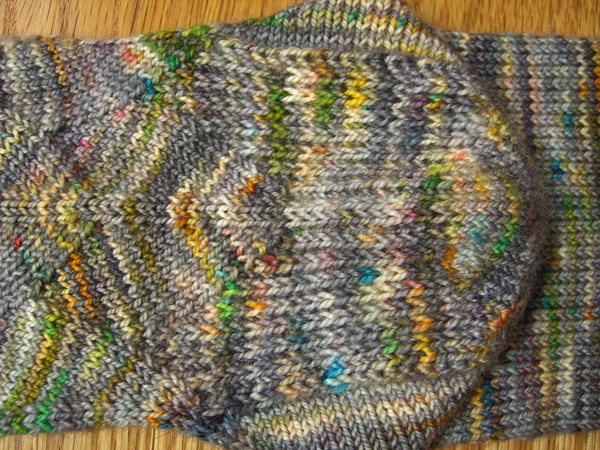 You will recall, gentle reader, that this is the second attempt at a heel. The first attempt was not so happy. I really do like this heel, though. I’ve been known to stop perfectly nice people in their tracks and demand they look at it because it’s just so pretty. I love the way that the scale curves down into the heel. 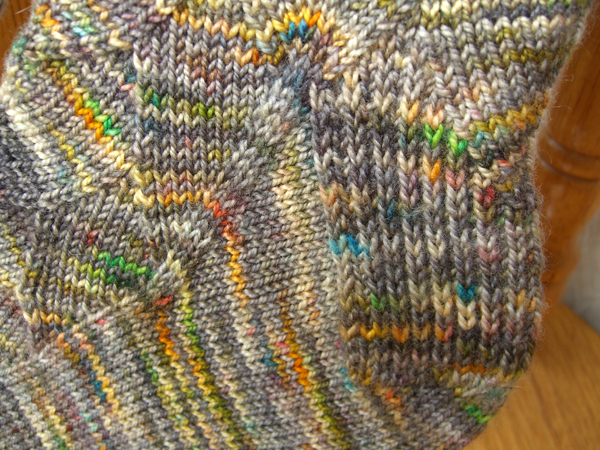 The heel, apart from the scale, is worked in standard heel stitch, with one exception: There is a double-slip-stitch in the middle to match the center two stitches of the scale. Oh, yeah… and they fit really, really well, too. I can’t wait until it’s cold enough to wear them! There is a new pair of socks on my needles (like you couldn’t have guessed that). They are one of Cat’s new sockitectures. I will have more info and pics tomorrow or the next day. Yarn: Koigu KPPPM (100% Superwash merino/ 50gr, 160m per skein) in colorway P342 (multi-grays with little blings of rainbow colors) — most of two skeins. Pattern: modified Dragon Scales from Barbara Walker’s Second Treasury Of Knitting Patterns, used with my own standard sock pattern, more or less. The heel flap is worked in heel stitch, with two slipped stitches in the center to flow into the scale on the back of the leg. Picot cuff, live stitches sewn down inside (stretchier than first binding off). Friday night Blue Moon Fiber Arts held a reception at the World Forestry Center to launch Cat Bordhi’s new book New Pathways for Sock Knitters: Book One I took off from work a wee bit early, it being Friday and all, and drove to a west-side park-n-ride lot to catch Max back to the Zoo. I was afraid that traffic and parking would both be frightful, because there was also a concert at the Zoo, and it was Friday so everybody would be trying to get out of town. Or into town. Depending on their inclination. But at any rate everyone would be trying to get somewhere and a goodly portion of them would be trying to get to the Zoo. So I rode MAX, which at that time, going towards town, was almost empty. The MAX stop at the Zoo is the deepest transit station in North America, and the second deepest in the world (no, I don’t know which is deepest). There are high-speed elevators that whisk you up to the surface in nothing flat. Every now and then people get stuck in them, and local news has a heyday. But that didn’t happen tonight. I would have been OK because I had knitting with me. But I’m glad I had the usual 20-second ride to the top. 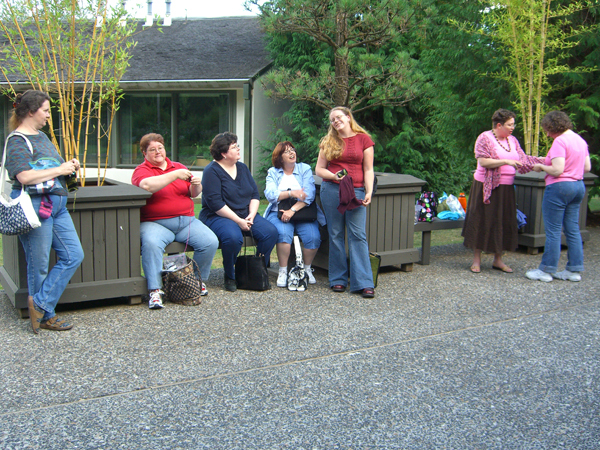 After knitting and chatting for awhile, we decided to wander over to the World Forestry Center and find the building (Miller Hall) where the reception was. It was not terribly well marked. We ended up briefly crashing a wedding reception, but eventually found Miller Hall. Blue Moon wasn’t quite ready for us, but it wasn’t too long before the doors opened and we were allowed in. Tables were set up in the foyer with stacks of Cat’s books for sale. There was no yarn. Blue Moon wanted the night to be about Cat’s books, and yarn would have been a distraction. A yummy distraction. But distraction nonetheless. 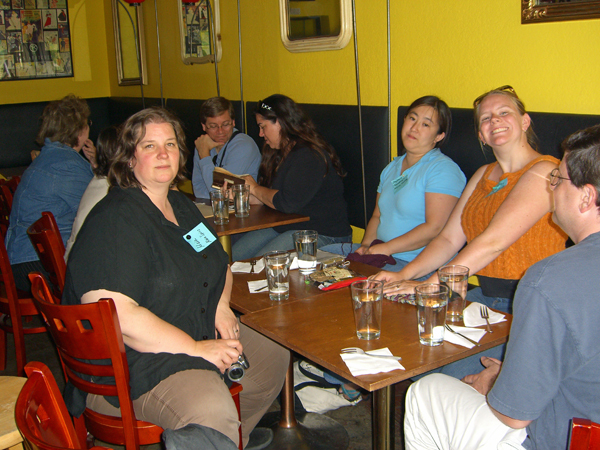 So we trooped into the hall, where the PDX Knit Bloggers, being the shy types that we are, pretty much took over the left-side front of the seating. Kathy was there, and Cindy and a ton of other people that I’m forgetting. All of the socks that are pictured in the book were spread out on the table where Cat signed her books. We got to look at all of them, and touch them, and admire them. And Cat very graciously answered all of our questions. I won two skeins, one for having dental floss (what, you don’t carry dental floss in your knitting bag? ), and another for having, well… certain feminine articles, let’s say, this being a family-friendly blog and all. You can see them here in my bag, along with the dragon-scale, snake-whatever socks: One skein of light STR in Blue Brick Wall, a gorgeous mix of ecru, periwinkle, cerulean and turquoise that will be on my needles soon I think; and a skein of medium STR in Metamorphic, a steel-blue, rust, gold, lime blend. Duffy won a skein of Oregon Red Clover Honey STR. I had been dying to see this colorway, as a possible contender for the Bee Fields shawl. On the Blue Moon site, the color looks reddish. But the skein I saw was a beautiful golden honey color. And it’s available in a silk lace-weight. That might be the one! Cat, as always, was witty and charming and told wonderful stories — I think mostly off the cuff. 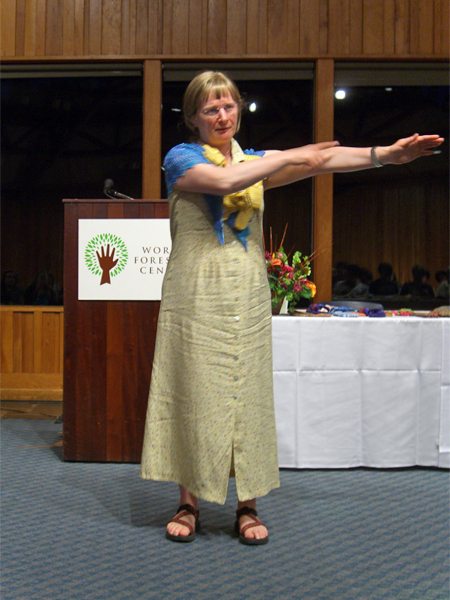 In the picture, she is showing how to knit a treehouse. If nothing else does, that should give you a clue what a strange and wondrous place the mind of Cat Bordhi is. Who else would have thought of knitting a treehouse? Who else would have thought of eight completely new sock architectures? 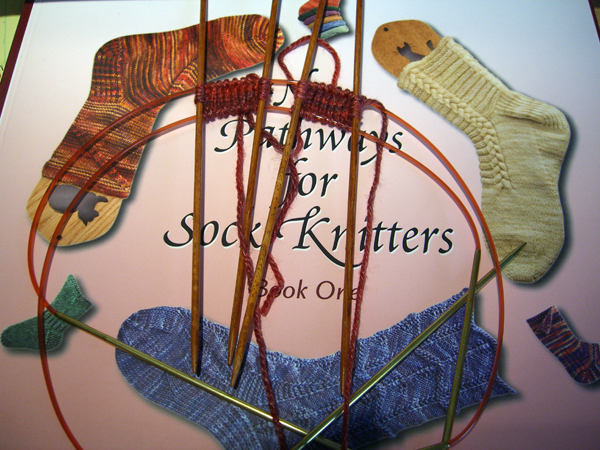 The new sockitectures in her book arose after she realized that the gusset triangles that we sock knitters have, for hundreds of year, been carefully placing to either side of our foot, could in fact be placed anywhere around the foot without changing the fit of the sock. It’s completely brilliant. So there is a sockitecture with the arch shaping underneath, and one with it on the top, and one that has a big gusset only on one side, and one with the increases running in a spiral around the foot and up the leg — eight sockitectures in all with little baby socks to practice on. 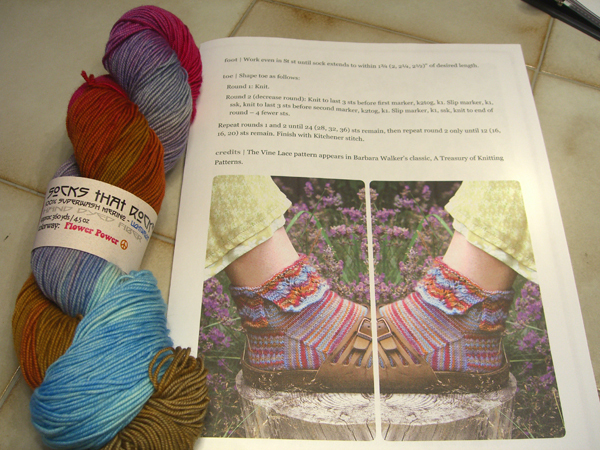 Book two will reveal sockitectures that don’t start at either the toe or the heel. That should be very interesting! I can’t wait for book two. Through her whole talk, Cat wove the theme of three things that knitting is made of: Knits, purls, and that unnameable something that makes knitting a magical thing that captivates us and nourishes us and keeps us buying yarn. Cat announced that her book has sold out (Blue Moon still has a few available via their web site), and the second printing will not be available until October! And then she completely and totally embarrassed me by thanking me again for getting the flu one day and making up the Magic Cast-On. If you have a chance, check out Cat’s new You Tube videos showing many of the techniques she uses in the book. And I, who was feeling a little bit slightly famous and cool was reminded that the universe does like to keep me humble. I was asked, for the very first time by a stranger, to autograph a book. She said to me, I have no idea who you are but you’re somebody famous, so sign my book. I truly think it was one of the funniest things anyone has ever said to me. And the other PDX Knit Bloggers got a pretty good laugh about it, too.